This is a question that divides opinion, some people view it as caging a dog, and that it’s cruel. Of course, it can be become a negative thing if used as punishment. The idea of a crate is to provide a safe haven that your dog chooses to go to. This involves an element of training, and must be done over time, so that your dog acclimatises to it, without stress. As you can see from the picture, this litter of puppies has spent time in a crate (they were on there way to the vet), and in each other’s company, they are happy to do so. When you bring your dog home (whether it be a puppy, or an older dog), if they are not used to being in a crate on their own, it can be a traumatic experience for them. The best way to avoid this is to have the crate in a quiet part of the room, where you spend most of your time as a family. Cover ¾ of the crate with a blanket (only having the entrance uncovered), make it inviting, with a bed, toys, and something to chew on. Allow the dog to investigate of its on accord. You can reward its curiosity, by throwing in treats when they go in, even if it’s just their nose that goes in. Don’t make a huge fuss; quiet praise of “good dog” is sufficient. Sometimes you don’t even need to say anything, rewarding with food tells your dog that they are on the right track. Continue to do this for as long as you can, until your dog is happy to spend a bit longer in there. At this point, you can shut the door, for a brief period, then open it again, and quietly walk away. Again, don’t talk; your actions will speak louder than words. You can very gradually build up the time that the time that the door is shut, just so that your dog gets used to the idea of it being shut from time to time. It is important to stress that the door does NOT have to be shut when your dog is in there. Once they have a good association with it, you’ll be surprised how long they will stay in there to sleep, or just to have quiet time, when the house is chaotic. 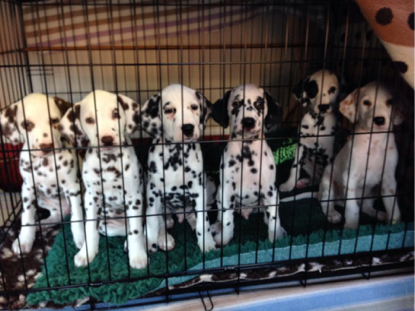 It’s a great aid to toilet training, when they are puppies (remembering to build up their association with it first, a stressed puppy will likely do their toilet in the crate), useful if your dog has had surgery, and needs crate rest, or a nervous dog, that struggles with visitors in the house. 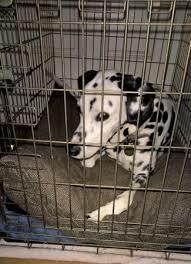 As an alternative to the crate, if your dog really does not like the concept (never force a dog to do anything it doesn’t want to do, or feels it needs to do it through fear), put a bed behind the sofa or chair, and teach an “on your bed” command. The command won’t need to be used for long, as your dog will understand that there is another option of where to lie down, away from all the hustle and bustle.